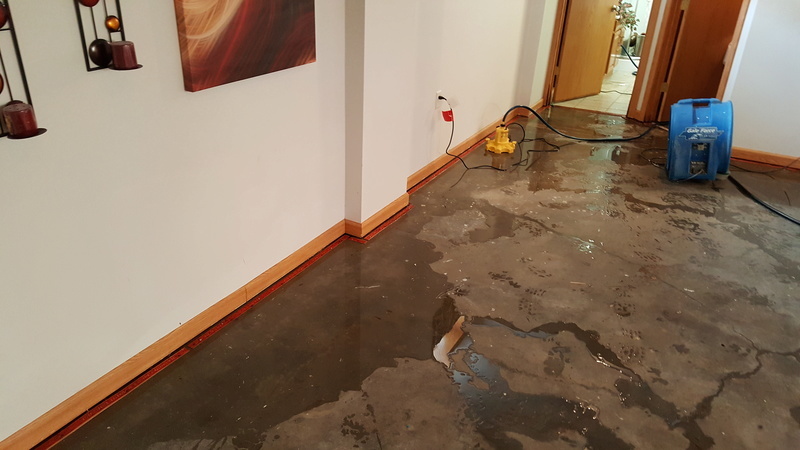 I returned for day 2 on the recent basement flood. I deployed 4 submersible pumps called "Water Bugs" and fired up the TNT. After an hour worth of pumping, the basement was near dry....until I shut down. Water was still flowing into the basement up through cracks in the floor and along the walls on one side of the home. It was like digging a hole in the ocean. Forecast says more storms over the next 2 days as well, so this one is turning into trouble. At least I was able to remove the carpet today. It was only 6 months old and the owner begged me to try and save it. So, I dragged out a 187 sqft saturated carpet up the stairs in 2 pieces. It nearly killed me! I might have to mount an electric winch on the truck in the future. Once outside, I gave it a Sporicidin treatment and extracted. 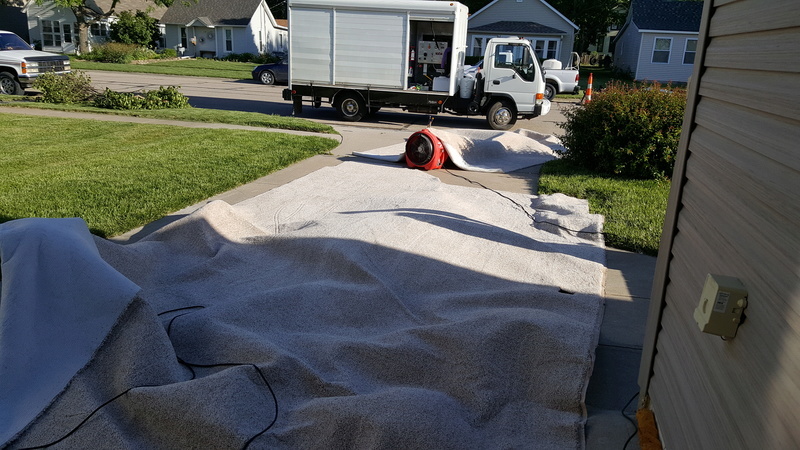 The fun part was trying to float-dry the carpet in the driveway. I don't think any of the neighbors had ever seen that one before. It was a little crazy, but it worked and I got it dry. The large lumps are actually the air flowing beneath it whipping up the carpet like a flag. I was running a LOT of wind beneath these things. In the foreground were 2 Sahara squirrel cage fans at the end of the driveway was a Gale Force air mover. It was impressive. I have the carpet laid out in a storage unit right now, but it might be a week before the basement will be ready for the attempt to re-install. I don't have much hope for this one...it is going to get ugly. 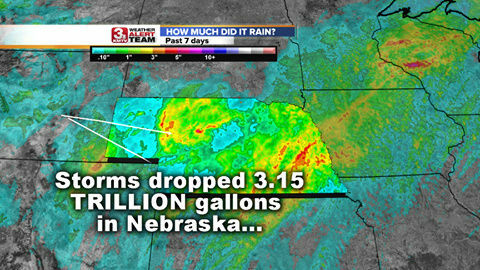 This is the pump that I was mentioning...the "Water Bug". I was very impressed by it, quiet operation, 20 gpm, and pumps down to 1/16 of an inch!! Hard to find a pump that can match it. You dragged that carpet-wet; up stairs and out side. Holy %#* that must of been heeeaaavvvyyyy! No way I would have wanted to drag that heavy carpet. Waterbug looks cool. I bet they have a price to match too! I don't know what they folks intend to do, but I sure would not want to have to deal with flooding every time it rains heavy. I'm sure it's one of those situations that in order to fix the problem, you will need a second mortgage to fix it right. Hmmm, I really really hope, for your sake, you get paid REALLY REALLY well on that job, dragging that carpet will definitely kill my back and put me in disability for the rest of my life !! That carpet was a killer and I will not likely try that ever again. Even if I had 2-3 people, I would not want to try that again. That little water bug pump was under $100. You are correct Freemind, floods like this end up costing a fortune...to the tune of $5000 - $8000 and insurance will not cover any of it. As for getting paid really well? Nope, very little actually. This lady needs the help and is a well liked member of the community. I am charging very little and hoping that other contractors in town will do the same once I get rid of this water. I didn't have any other jobs pending, so I had the time. Damn !! Should've sent some of those water in CA huh ? You are welcome to it....I know where I can pump out a few thousand gallons for you to take home. I just went back to this house to pick up my pumps and other equipment and the contractor working at the place said there was still water coming in.....after a week??!! Sure enough, the West wall still had water coming in where the wall and floor meet. I checked the 3-Water bugs and they were still pumping away 24/7. There is no way this is still from the rain last week. I spoke to the neighbor again (to her West side) and found that they did have a flooded basement as well, but the neighbor on the East side was dry. That tells me a city pipe is leaking. I called the city and they told me to "you know what" up a rope. I went between the houses and found 2 depressions in the soil. I used the Joe Bristor lawn picks to probe them....virtually no resistance pushing them in. The soil is not compacted and likely is becoming a sink hole. I called the city again, they told me they "might" send somebody out on Tuesday after the holiday. One of the good things about hiring a carpet cleaner who used to be a water chemist is that I can test things. I tested the water being pumped out of the basement.....fluoride. The city is sending a guy out to trace the line right now. I don't know what sort of effort he will put into this, but in my book, the city will be buying this lady a new basement remodel. Some days it feels good to help people. This will be one of those special ones if it works out. I don't understand that, the city is ran by state government and they are assigned certain $$ to fix crap like that, it irritates me when city employee is trying to avoid the problems they should take care of in the first place. The drama continues. The city disagreed with my water testing and denies that it contains fluoride. So, they are not willing to investigate the ground depression. I am going to have to go back and insert a metal probe to measure the depth of the water table and compare it to the basement. I am pretty certain of what I am going to find, but they will likely have some other answer for that as well. If it was my basement, I would have a back hoe in that yard already confident that the city was going to have to pay the bill in the end, but it isn't and I am not the contractor for this job. I would like my pumps back though. Well, the way I see it is you've done what you could do for them, as much as I want to help others as best as I could, sometimes there is a limit, if that happens in CA, I'm sure the home owner would've hired an attorney by now and they would've probably settled it ( I guess there is a good reason to live in a sue happy state huh, lol ). That is probably true...I will have to charge additional fees for them. At this point it would be cheaper for them to just buy me new ones when it is over.